Raxle Berne is an Imperial enforcer and head of the Berne Vampire clan. 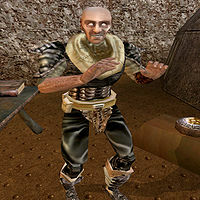 He can be found in the Observatory in their lair, Galom Daeus, in the Molag Amur region. If you become a vampire of the clan, he considers you to be an expendable mistake and sends you on a few quests that he expects will get you killed. The Vampire Merta: Kill this former member of the clan in the Reloth Ancestral Tomb. Slay Raxle Berne: Cleanse out the vampire lair Galom Daeus and kill the elder vampire Raxle Berne. Esta página foi modificada pela última vez à(s) 19h39min de 22 de junho de 2013.